NEWTOWN SQUARE, Pa. (AP) Keegan Bradley had bottomed out, crashing from the high of winning the PGA Championship to tumbling out of the top 100 in the world. His chances to represent U.S. teams in international play had dried up, his preferred putting method was banned, and the confidence that once put him on the cusp of greatness was shot. "It's scary when I look back, because I didn't know I needed this much improvement," Bradley said. He was like a scientist in the lab, changing his swing, his putting stroke, his fundamentals - investing in the work needed to get to where he was Monday on soggy Aronimink: going head-to-head in a sudden-death playoff against the new No. 1 player in the world, Justin Rose. For a player who had to reinvent his game, the clutch moment didn't seem so scary. Bradley topped Rose with a par on the first playoff hole to win the rain-plagued BMW Championship for his first PGA Tour victory in six years. Bradley's fourth career win meant a bit more than the others - yes, even the major he won in 2011 - because he held more than a trophy and a $1.62 million check. He also got to give his young son Logan a victory toss in the air on the 18th green for the first time. Bradley, who shot a final round 6-under 64 to finish at 20-under 260, thrust his arms toward the gray sky and drizzle in celebration and waved his family toward him to bring them in for a lengthy embrace. "I've won before, and I win and I finish, and I go home, just me," Bradley said. "Now, I get to go back and we get to have fun and enjoy it together. It's just a completely different experience." Rose left Aronimink with a new reality as well. Though he was runner-up at the FedEx Cup playoff event, he didn't come up short in the world ranking. Rose moved No. 1 in the world ahead of Dustin Johnson and became the 22nd player to reach the top spot since the ranking began in 1986. Rose could have won in regulation, but his 16-foot par putt on the final hole lipped out to force the playoff. He fell short again in the playoff, missing a 5-foot par putt that would have kept him alive. The 38-year-old Rose had grown to love suburban Philadelphia golf courses with wins at the 2010 AT&T National at Aronimink and the 2013 U.S. Open at Merion. He didn't get a trophy on this trip. But a No. 1 ranking will do for Rose, who joins Nick Faldo, Lee Westwood and Luke Donald as the only Englishmen to reach the top spot. He is the No. 2 seed behind Bryson DeChambeau among the top 30 who advance to the Tour Championship starting Sept. 20 at East Lake in Atlanta, giving him a clear shot at the $10 million prize. "I'm delighted to be world No. 1," Rose said. "Boyhood dreams, you know what I mean ?" Bradley also had a number in mind - 30. He started the week at No. 52 and needed to crack the top 30 to be eligible for East Lake. "A lot has happened to me over these six years," Bradley said. "I kind of fell off the radar there for a little while. It's tough to go from being on Ryder Cup teams, being on Presidents Cup teams to being outside the top 100 in the world." 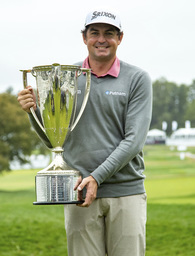 Bradley, who birdied the 16th and 17th holes to storm up the leaderboard, finished with his fourth career victory and first since the 2012 WGC-Bridgestone Invitational. He gets a trip to Maui to start next year for the winners-only Sentry Tournament of Champions. "I was watching the leaderboard pretty closely. I don't normally," he said. "It made me feel calm, which is rare. That was good." Bradley had to wait nearly two days before chasing down Rose. Rain soaked the course on Sunday, canceling play and forcing the Monday finish. It rained only lightly on Monday and players had few complaints about the condition of the course, even if the walking paths became a muddy, soggy mess for the gallery. As usual, it crowded around Tiger Woods. Woods caused some more noise - he's been doing that a lot in recent months before the largest galleries at every course - and got within one shot of the lead when he birdied the par-5 ninth to go out in 31. But he missed the green on 10 and made bogey. He found a bunker on the par-3 14th for another bogey. And this was the kind of day when more than one mistake was going to be costly. Woods wound up with a 65 and finished three shots back. Such was the scoring at Aronimink that Woods had a 72-hole score of 263 for the sixth time of his career. The other five times he won; this one got him a tie for sixth. "I thought I needed to shoot something around 62 today to have a chance," Woods said. "And I don't think that would have been good enough." Turns out, a 62 would have put him in the playoff. Woods took away any suspense about getting back to the Tour Championship for the first time since 2013. That was about the time he was just starting to cope with back pain. He had his fourth back surgery in April of last year, and at this time last year he had just been cleared to chip and putt. "To say that I made it back to the Tour Championship after what I've been through is a pretty good accomplishment," Woods said. Jordan Spieth will not be joining him . Spieth started 27th in the FedEx Cup standings and took a step backward, finishing with a 73 to tie for 55th. He fell out of the top 30 and will miss the Tour Championship for the first time. That means he will have played only 24 tournaments this season. Because he didn't add to his schedule a tournament he had not played in the last four years, he is in violation of the PGA Tour's scheduling policy. Still to be determined is the penalty. Spieth is the first player to violate the policy, which began last year. "I obviously accept whatever fine it is and move on and try and add one every year, but it's kind of tough," Spieth said. Bradley and Xander Schauffele, who finished one shot out of the playoff, moved into the top 30 to qualify for East Lake, and Emiliano Grillo joined Spieth as the two players who fell out.